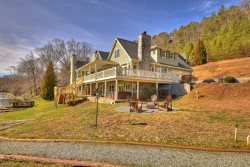 This amazing mountain retreat is waiting to host your next memory making vacation! Nestled in the Appalachians, sits this wonderfully adorned 3-bedroom, 3-bathroom cabin. With your next vacation in mind, Bearcat Lodge is equipped with everything you need to make your weekend getaway a complete success! The fully furnished kitchen makes preparing all of your favorite meals simple. And who wouldn't want to dine in that amazing dining area amongst the mountain?! The living room is cozy and perfect for cuddling up in front of the fireplace and watching your favorite shows, assuming you can take your eyes off of those stunning mountain views. With a bedroom on each level, privacy is easily offered; and everyone gets their own bathroom! The spacious lower level offers an entertainment venue with a shuffleboard table and a card table making game night unforgettable. The outdoor area is a force to be reckoned with. The screened in porch makes enjoying the outdoors a pleasant and effortless. In the cooler months, the outdoor fireplace will knock off the chill while you enjoy the great outdoors! Dining accommodations are offered on the entry level deck just in case you can't get enough of those glorious mountains from the inside of the house. Come find your "second home in the mountains" at Bearcat Lodge. Everyone was very nice at check-in and it was nice to get a call the next day making sure our first night was great. From the moment I booked, the staff was wonderful. I cannot say enough great things about the staff we encountered. Everyone was very professional and the customer service was impeccable! We stayed in the Bearcat Lodge. I am in the hospitality industry and have worked for several high end properties, this was definitely comparable to a Four Seasons/Ritz Carlton level. From the customer service to the cleanliness!!! It was our first time in Blue Ridge and I found the Bearcat Lodge just browsing the internet. The property was perfect and the location even better. It had everything we needed during our vacation (we love to cook), so the kitchen was used daily! The view was incredible and couldn't get enough of the sunsets each day....amazing! The layout is perfect when you have multiple people, as each room has it's own floor. The driveway was steep and a little scary the first time, but never a problem for our SUV's. We plan on visiting again next year. See you again soon!!! A simple, lovely getaway. This home is for you if you love views. The hoise is spacious enough for a family of 5 but can hold 3-5 more people. I love the flow of the home with the open floor plan and loft style, master bedroom upstairs and home length view of the mountains . Add a downstairs large enough for another family, or just somewhere for the kids to retreat. Your team is great, but I don't understand the need to physically visit the office in Blue Ridge, particularly since you have keyless entry. We rent in other destinations and they provide the directions, etc. electronically just prior to check in day and give a keyless entry code that only works upon check in time. We've rented through you three times within the last year and are coming back next week. We would prefer not to have to drive into Blue Ridge just to get the address and keyless code. We loved the property. Amazing view, very clean, beautifully decorated with a well stocked kitchen! We would happily return to Bearcat Lodge! Super nice and clean place! Awesome view! Property....fabulous....everything we needed! I know some previous guests didn't like the steep driveway...didn't bother us..our FJ cruiser LOVED it! Good.Good response when needed leaves blown off steep driveway for access to property. Friendly and hilarious! :) Really down to earth! I really enjoyed this stay in the Bearcat Lodge. It was beautiful and I don't know if I could bring myself to choose another cabin besides this one. The view was unreal and breathtaking. Thank you so much for the most wonderful birthday. I will never forget it! Short driving distance to "Luxury Above The Clouds", "Wonderful Lodge", "A Bit Of Heaven", "A Little Piece of Paradise" and "Mountain High Lodge"